After 5000 miles, our 1974 Honda Long Haul CB450 gets a tune up to make sure it is still fit for the road. We part ways after the 2018 AMA Vintage Days. 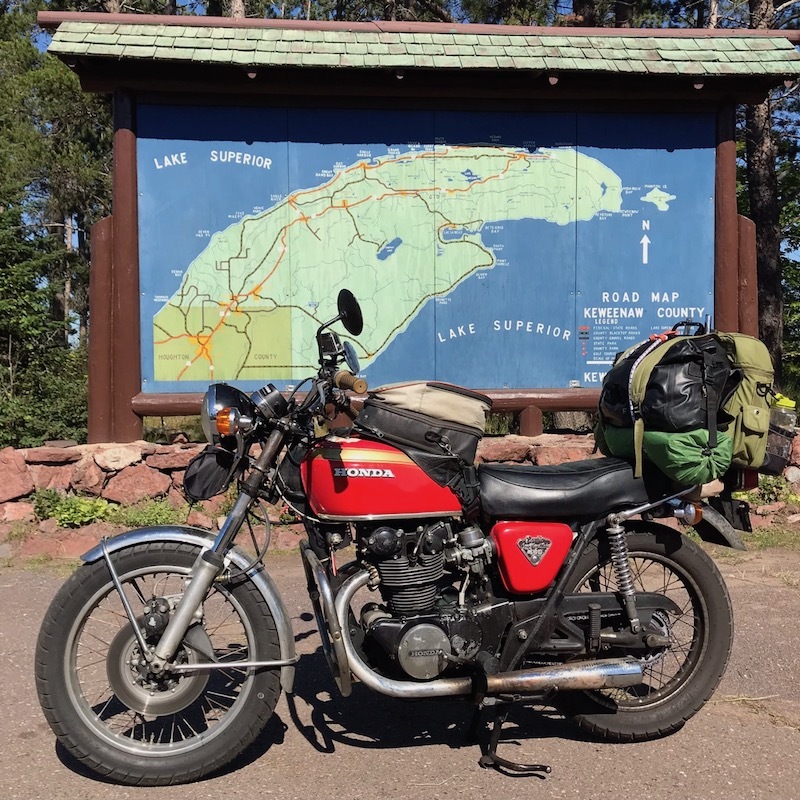 While most of the crew rides south back to Texas, our 1974 Honda Long Haul CB450 heads northbound across Michigan and over to Minnesota before the 1200 mile haul back to Houston. We finally hit the open road on our 1974 Honda CB450 starting in Houston, TX headed for Lexington, OH for the 2018 AMA Vintage Days. We put the finishing touches on our 1974 Honda CB450 in preparation for a 1,200 plus mile trip from Houston, TX to Lexington, OH for the 2018 AMA Vintage Days, on up to MN and all the way back. 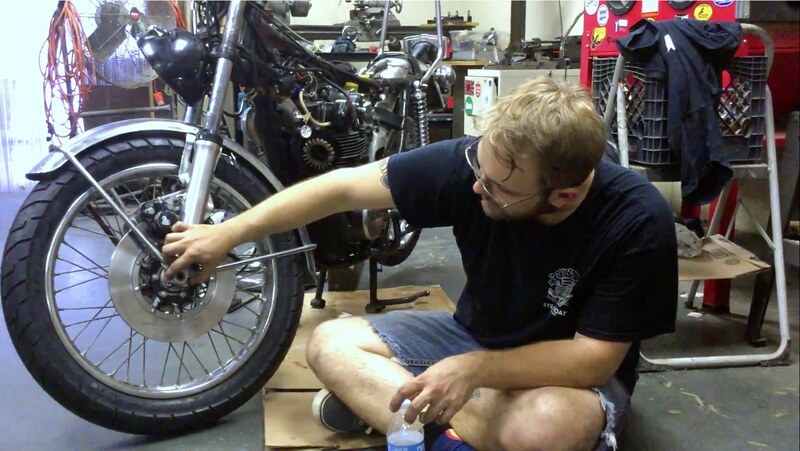 We freshen up the front wheel, forks, steering bearings, and hydraulic disk brake system on our 1974 Honda CB450 in preparation for a 1,200 plus mile trip from Houston, TX to Lexington, OH to visit the 2018 AMA Vintage Days. 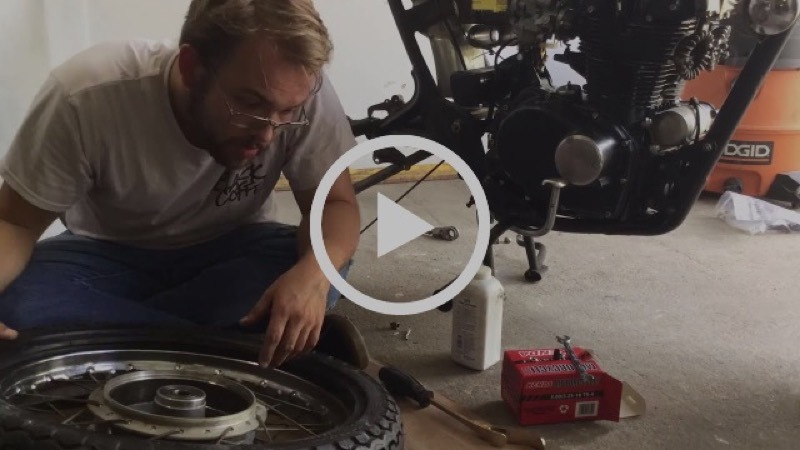 We freshen up the rear wheel, suspension, and drivetrain on our 1974 Honda CB450 in preparation for a 1,200 plus mile trip from Houston, TX to Lexington, OH to visit the 2018 AMA Vintage Days. Common Motor rebuild the carburetors and go through the electrical system on our 1974 Honda CB450 in preparation for a 1,200 plus mile trip from Texas to Ohio for the July 2018 AMA Vintage Days. 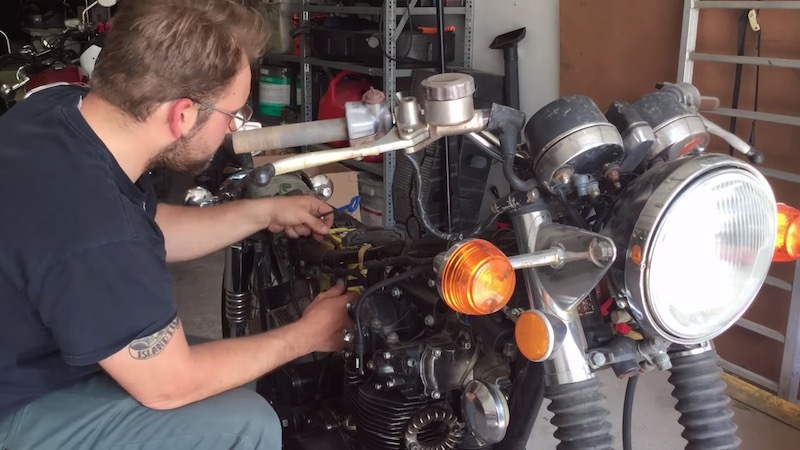 We tear into the engine of our 1974 Honda CB450 in preparation for a 1,200 plus mile trip from Houston, TX to Lexington, OH to visit the 2018 AMA Vintage Days. We take a Honda CB550F Super Sport and go over all the parts and tasks that needed to be performed to make the motorcycle ready to ride once again. The Honda CB550 series of bikes (CB550K, CB550F Super Sport & CB500K) is the 4th official motorcycle supported by Common Motor Collective. The new supply of ignition contact points for the Honda CB350 / CB360 / CL350 Scrambler / CL360 Scrambler / SL350 & CJ360 must be modified for proper ignition timing adjustment. The old stock of Japanese-made ignition points for these motorcycles have pretty much dried up, and we have to turn to points made in China to keep our bikes alive. As is, the new points won't cut it, however with a few simple DIY mods they get the job done and your bike back in tune. Follow along and we will show you the modifications necessary to make these ignition points work right. Follow along with us as we fix up, maintain and ride a 1974 Honda CB450 on a 1,200 plus mile trip from Houston, TX to Lexington, OH for the 2018 AMA Vintage Days. With several styles and dozens of brands out there, it is hard to know which type of battery to use on your vintage Honda CB350 / CB360 / CB450 / CB550. We've put together a comparison guide of the main styles of batteries that you will encounter out in the market with the pluses and minuses of each style. The oil filter or oil "rotor" found on the Honda CB350, CB360 and CB450 often gets neglected during standard oil changes. It should cleaned out every other oil change at 3000 miles / 5000 km. Accessing the oil rotor for cleaning takes some engine disassembly and parts to complete the job correctly. Follow along as we show you how it is done. A video on how to replace your carburetor diaphragms on your Honda CB350 or Honda CB360. Our Honda CL350 & CB350 carburetor is ready to be reassembled. We begin by installing the critical parts in the float bowl area of the carburetor and getting the float height correctly set. The Honda CL350 & CB350 family of motorcycles used three different carburetors over the production run. We show you how to identify the carbs type, how to take them apart and which pieces you might need to replace during a rebuild. We are taking apart the 1973 Honda CB450 engine from project Diamond. Part one focuses on the engine top end (head, cams, jugs, etc). The disassembly continues on our 1973 Honda CB450 engine from project Diamond. Part two focuses on the engine bottom end (crankshaft, transmission, crankcase, etc). The engine removal from project Diamond continues. We will show you how to use an impact driver , along with the final parts coming off the bike to get the engine out of the frame an on the bench. In order for the engine to be rebuilt, we need to pull it out of the bike. This takes longer than you might expect, so here is part 1 of the engine removal process. New cam chain tensioners and chain guides are here for the Honda CL350 / CJ360 / CB360 Family of motorcycles. We will show you how to swap out the old ones for a fresh set. Our winter project here at the Common Motor Collective is a 1973 Honda CB450K that has been named "Project Diamond." Over the next few months; we'll show you what parts, tools and process necessary to rebuild this vintage Honda from the ground up. This video post details the process of carburetor synchronization for the Honda CB360. While this synchronization video is specific to this model the general process is similar across all of the Honda twins. In this second installment of our technical documentation videos we follow up our master cylinder disassembly with the rebuild of the master cylinder. In the video we show you the correct installation of our master cylinder rebuild kit to answer any of the questions that you may come across during your rebuild.